In this article, we will discuss important Concurrency Utility Executors class with examples. We will use Java 8 Lambda expressions in examples. Executors Class provides factory and utility methods for Executor, ExecutorService, ScheduledExecutorService, ThreadFactory, and Callable classes defined in this package. Executors Utility class provides a list factory and utility methods are shown in below class diagram. In this article, we will discuss five important utility methods of Executors class with example. This method creates an Executor that uses a single worker thread operating off an unbounded queue. (Note however that if this single thread terminates due to a failure during execution prior to the shutdown, a new one will take its place if needed to execute subsequent tasks.) Tasks are guaranteed to execute sequentially, and no more than one task will be active at any given time. Unlike the otherwise equivalent newFixedThreadPool(1) the returned executor is guaranteed not to be reconfigurable to use additional threads. 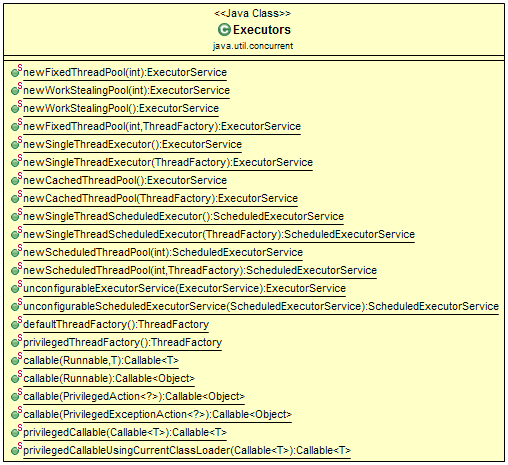 Note that Executors.newSingleThreadExecutor() Method returns the newly created single-threaded Executor. In this example, let's instantiates a thread pool with a single thread. All tasks are executed sequentially by the same thread. We have used newSingleThreadExecutor, so when we have submitted 3 tasks, 1 new thread will be created and will execute 1 task at a time. Other 2 tasks will wait in a wait queue. As soon as one task will be completed by a thread, another task will be picked by this thread and will execute it. This method creates a thread pool that can schedule commands to run after a given delay or to execute periodically. ScheduledExecutorService interface provides The schedule() method to create tasks with various delays and return a task object that can be used to cancel or check execution. The scheduleAtFixedRate() and scheduleWithFixedDelay() methods create and execute tasks that run periodically until cancelled. Let's understand the methods of ScheduledExecutorService Interface and newScheduledThreadPool() factory method with an example. This method creates a single-threaded executor that can schedule commands to run after a given delay or to execute periodically. (Note however that if this single thread terminates due to a failure during execution prior to the shutdown, a new one will take its place if needed to execute subsequent tasks.) Tasks are guaranteed to execute sequentially, and no more than one task will be active at any given time. Unlike the otherwise equivalent newScheduledThreadPool(1) the returned executor is guaranteed not to be reconfigurable to use additional threads.